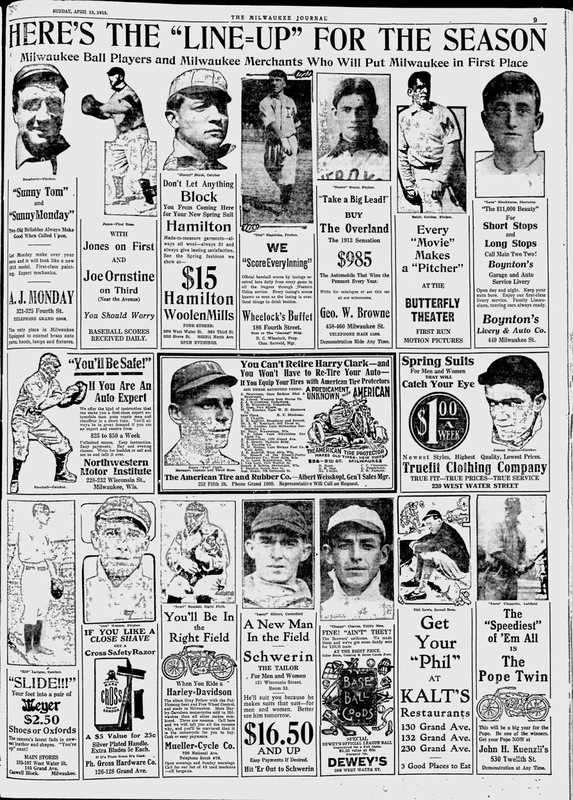 Borchert Field: This Week in 1913: "Here's the Line-Up for the Season"
This Week in 1913: "Here's the Line-Up for the Season"
It's a tidy promotion for both the Brewers and local businesses, who together will "Put Milwaukee in First Place." For each man, a matching ad; "Get Your 'Phil" at Kalt's Restaurants" for second baseman Phil Lewis, "Spring Suits That will Catch Your Eye" for backstop Johnny Hughes. I particularly like equating Cross Safety Razor's "Close Shave" with pitcher "Doc" Watson. 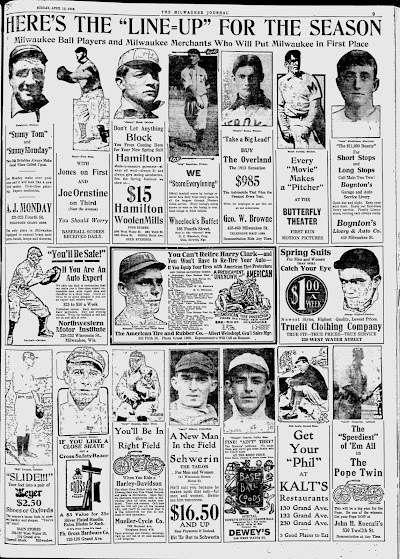 There are some real groaners, though, including pairing catcher Jimmy Block with the slogan "Don't Let Anything Block You From Coming Here for Your New Spring Suit", and especially the ad in the center, featuring player/manager Harry "Pep" Clark and slogan "You Can't Retire Harry Clark—and You Won't Have to Re-Tire Your Auto—If You Equip Your Tires with American Tire Protectors". Note also the ad for the Harley Davidson motorcycles, then a mere decade old, featuring right fielder Newt Randall (because "You'll Be In the Right Field When You Ride a Harley-Davidson"). The silent Gray Fellow with the Ful-Floating Seat and Free Wheel Control, and made in Milwaukee. More Harley-Davidson motorcycles sold in Milwaukee than all other makes combined. There are reasons. Call here and we will tell you all the reasons why, and you'll be convinced that it is the motorcycle for you to buy. Who could resist such an entreaty? It's a hundred years later, and I still want to hear all their reasons why. There's another ad I find equally interesting, this time for its connection with the Brews. 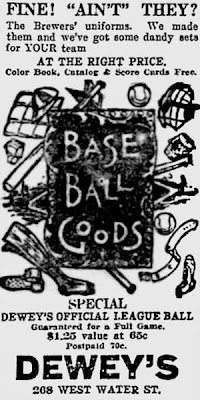 Dewey's Sporting Goods proudly proclaims that they made the Brewers' uniforms. The one example of a jersey we have from that season bears in its collar the tag of a P. Goldsmith and Sons of Cincinnati, Ohio. Perhaps that jersey was sold to the Brews by Dewey's, or was a re-purposed jersey from an earlier season. 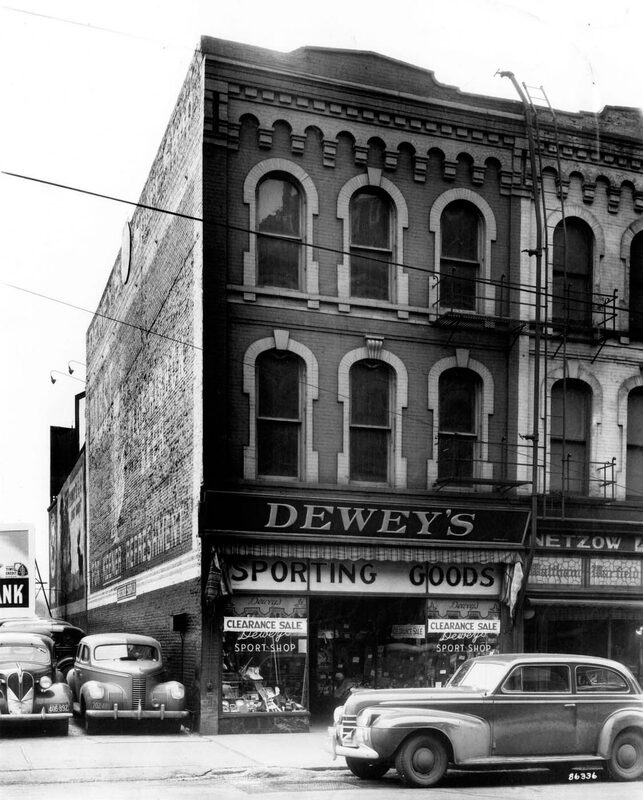 As for Dewey's itself, it was founded by Charles J. Dewey, who also sold jewelry. 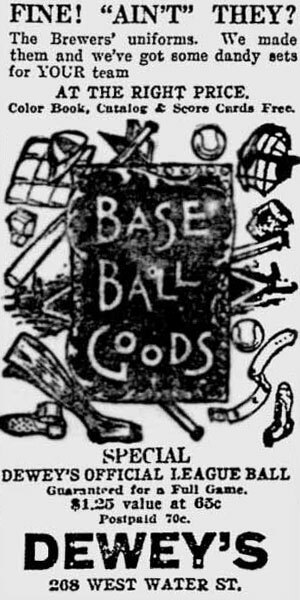 An ad for his sporting goods store appears in our 1903 tavern scorecard under the name "Victor Base Ball Goods". I don't know how long Dewey's could make the claim that they supplied the Brewers; by the early 1930s Burghardt Athletic Goods had taken over that business.